Chicken Pot Pie, a old fashioned pie filled with chicken, vegetables (carrots, potatoes, celery, onions), and a thick savory sauce...an American classic (often made during Thanksgiving in my household) and definitely on my list of comfort foods. I've always had the good fortune of not tasting an inferior chicken pot pie. Even the chicken pot pies from Marie Callender’s in the frozen food section is quite good. I always thought that making your own chicken pot pie would be fun to do, but making the pie crust seemed kind of intimidating. Luckily, the good people at America's Test Kitchen came up with a way to make chicken pot pie but without the pie portion. Check out the episode (season 11, episode 1: Old-Fashioned Sunday Dinners) featured below to see for yourself. Instead of making this classic dish in pie form, they show ushow to do it in a way easier to do crisp version...a chicken pot crisp I guess. We still have to make the dough for the crumble topping but it doesn't have to be exactly perfect the way a pie crust must be. You can find the recipe and corresponding video to the demonstration below. Update 11-29-13: this recipe is perfect for those of you who have extra turkey from Thanksgiving leftovers where instead of chicken you use the leftover turkey for a turkey pot pie (see recipe for making a Thanksgiving turkey). 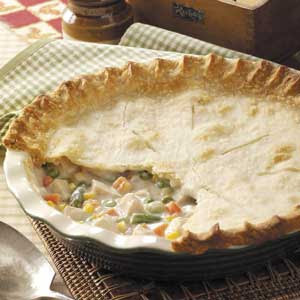 For your turkey pot pie, you can use either the white or dark meat - either or both will work. This recipe relies on two unusual ingredients: soy sauce and tomato paste. Do not omit them. They don’t convey their distinctive tastes but greatly deepen the savory flavor of the filling. When making the topping, do not substitute milk or half-and-half for the heavy cream. 1. FOR THE CHICKEN: Bring chicken and broth to simmer in covered Dutch oven over medium heat. Cook until chicken is just done, 8 to 12 minutes. Transfer cooked chicken to large bowl. Pour broth through fine-mesh strainer into liquid measuring cup and reserve. Do not wash Dutch oven. Meanwhile, adjust oven rack to upper-middle position and heat oven to 450 degrees. 2. FOR THE TOPPING: Combine flour, baking powder, salt, black pepper, and cayenne pepper in large bowl. Sprinkle butter pieces over top of flour. Using fingers, rub butter into flour mixture until it resembles coarse cornmeal. Stir in Parmesan. Add cream and stir until just combined. Crumble mixture into irregularly shaped pieces ranging from 1/2 to ¾ inch each onto parchment-lined rimmed baking sheet. Bake until fragrant and starting to brown, 10 to 13 minutes. Set aside. 3. FOR THE FILLING: Heat 1 tablespoon oil in now-empty Dutch oven over medium heat until shimmering. Add carrots, onion, celery, ¼ teaspoon salt, and ¼ teaspoon pepper; cover and cook, stirring occasionally, until just tender, 5 to 7 minutes. While vegetables are cooking, shred chicken into small bite-size pieces. Transfer cooked vegetables to bowl with chicken; set aside. 4. Heat remaining tablespoon oil in empty Dutch oven over medium heat until shimmering. Add mushrooms; cover and cook, stirring occasionally, until mushrooms have released their juices, about 5 minutes. Remove cover and stir in soy sauce and tomato paste. Increase heat to medium-high and cook, stirring frequently, until liquid has evaporated, mushrooms are well browned, and dark fond begins to form on surface of pan, about 5 minutes. Transfer mushrooms to bowl with chicken and vegetables. Set aside. 5. Heat butter in empty Dutch oven over medium heat. When foaming subsides, stir in flour and cook 1 minute. Slowly whisk in reserved chicken broth and milk. Bring to simmer, scraping pan bottom with wooden spoon to loosen browned bits, then continue to simmer until sauce fully thickens, about 1 minute. Season to taste with salt and pepper. Remove from heat and stir in lemon juice and 2 tablespoons parsley. Hello @Unknown the recipe for chicken pot pie from America's Test Kitchen indicates that your oven should be at a temperature of 450° F.